Let's all enhance our Happiness Quotient! A very insightful post. And yes, I too ended up becoming a major believer in the power of 'the secret' a few years ago, choosing to attract good things into my life. That's is such a wonderful post! We have about 30000 thoughts per day or about 40-50 thoughts in a minute! Our mind is such a tricky place! I loved your pointers to keeps the negative thoughts at bay! We are what we think. 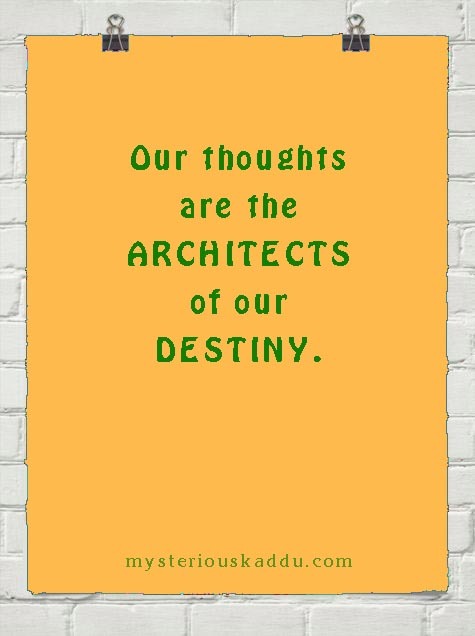 Our thoughts shape us and build us... and it is so important for us to have positive thoughts and take control over the negative ones! Hi Chicky, How nice to provide a road map for people who may struggle to get out of a negative state of mind. It is easy to bring ourselves down further once we start down the negativity path in our minds. Ideas for how to bring ourselves back out are always helpful. Thank you for this post Kaddu. I have a constant battle keeping my thoughts under control. Even when I'm in bed at night they jump around reminding me of things I don't need to remember, and stressing how important non-urgent issues are! I need to read through all your posts when the challenge is over! T is for Tempting Titles as you Build a Better Blog. #AtoZchallenge. Gee, great minds think alike, Eh, Chicky? I did Thoughts today, too. Very informative and wise post you wrote. So true that negative thoughts can affect our every waking moment. Our thoughts define us. So simple yet so hard to reign them at times. I can succumb to negative thinking on occasion. Such a self defeating way of being that wastes so much energy and time that could be used for better things, don't you agree? I had a negative thought this morning that why am I bothering to do these posts as no one reads them anyhow. Talk about negative! I had to banish that thought and keep writing. I like your format how you are connecting all your posts. So cohesive that way. Agree with the thoughts and pointers you shared. They say, the soul becomes dyed with the colour of its thoughts. So it's important that we dye it with happy and positive thoughts. Great tips for happy thoughts Chicky. They say we can thin kour way to happiness by sending out our thoughts into the universe and the divine complies with our wishes! I am fascinated by peoples minds on a daily basis. Sometimes I think I should keep my thoughts to myself. I used to dwell on the negative, but I'm getting better at letting go. Hi. Thanks for visiting my blog. You've clearly put a lot of thought and energy into your topic - well done! Thank you, Hilary. It is very important to keep focus on our goals. Oh yes, Geets! It is crucial to be in control of our minds! Same here, Shirley! There was a time when I was actually scared of bed time! 'Coz that's when all the "demons" in my mind would start to haunt me! Took me a long time to find my way out of that place. It sure is an art, Vinodini. And it requires constant vigilance to keep our thoughts in control. Oh yes, Cathy! The wastage! I forgot to mention that! Glad you brought it up! Whenever I get into a negative spiral of thoughts, I end up feeling worse because of all the time I wasted in that state! Like you said, we can do so many other things in that time. And it does work, Shalini. I have tried it personally. Though I haven't yet mastered this art. Same here, Crackerberries Anderson. I was caught in a vicious negative thought cyclone few years ago! And you're right. We don't feel like sharing our negative thoughts with anyone, because people tend to invalidate them. And that just makes us feel worse. I find it better to spend time with people who make me forget all the negativity in my mind. That's an important point, Donna. Some things are easier to let go of than others. I admit that I had dismissed the secret theory in the past. Of late though I'm making a lot of changes, and yes, I see where all your tips apply. The most important thing would be to cut off negative people - you'd be surprised when you find out how bogged down you were cos of them. I've been doing exactly that, Sreesha, for the last few years. And it is already helping. I truly believe that thoughts create and you attract what you give focus too. But it is hard to maintain a constant positive state. The trick however is not to dwell in the negative thoughts for too long. True, Raji... and it gets difficult to break out the habit once it's formed! Our mind is so fast and furious - just thinking of the volume of the thoughts you have specified makes me wonder how we really are able to do all these things with such a small brain. I know, Menaka! I have wished so often that I could take my mind out and put it in the freezer for a while! You really nailed the truth in this post. What we think essentially is who we are and what we become. It's a mystery to me why different people think as they do. I've always been a relatively positive thinker. Even in my darkest times of pessimism it's difficult for me to be consistently depressed or have a continually negative outlook on the future. Life is good when we make it good no matter what the situation might be. You have a point there, Arlee. I'm one of those perpetual pessimists. At least, I have been so for the last few years. I wasn't like this earlier though. Maybe I got exposed to too much negativity for too long? I think one thing leads to another, and eventually, we get caught in a loop. Thank you for stopping by!